Check out our innovative E-Learning System that makes learning easier; this resource was developed by our course coaches to help our students succeed! Are you eligible for a VET Student Loan? Learn Remedial Massage On-Campus or Online and Become a Qualified Massage Therapist. Excellent student support, ultimate flexibility and convenience, and affordable course fees with VET Student Loan options available for eligible students and courses. Learn science-based massage courses in a friendly, relaxed environment from experts in the field. Unwind in our student clinic with a Relaxation Massage. Relieve tension and pain with Remedial Massage. Treat injury and dysfunction with Myotherapy. Study anywhere, anytime, at home, on-campus or on the bus with our e-learning system! Q Academy has developed an online learning platform that has all of your course content, reference materials, assessments and interactive videos to make your study experience more convenient than ever. Click on any of our nationally accredited on-campus or online courses for more information, or download the relevant course guide. If you have any questions call us on 1300 20 40 80 for personalised advice. Our science-based Diploma of Remedial Massage has been expanded with new subjects and modalities to broaden the therapist’s skill-set. This elevates the course above our already established industry-leading training! or download our course guide! Study a massage therapy course online with Q Academy. Complete the HLT52015 Diploma of Remedial Massage online, with the ultimate flexibility and convenience that comes with studying online. 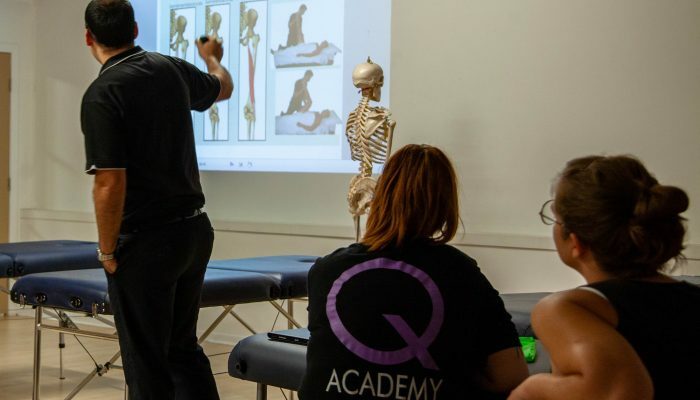 Q Academy’s Remedial Sports Therapy program can give you the specialist knowledge and skills needed to assess, train, treat, prevent dysfunctions and rehabilitate professional or recreational athletes of any sport. Q Academy’s HLT42015 Certificate IV in Massage Therapy is an elementary-level qualification in the massage industry. It will give you the basic theoretical and practical skills surrounding massage therapy. Maximise your career potential, expand your manual therapy skills and increase your treatment scope with dry needling, kinesiology and rigid tapping, corrective exercise prescription and the use of therapeutic modalities such as TENS. 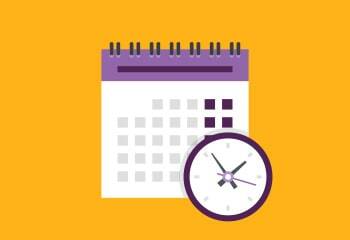 Want to start your journey to becoming a massage therapist, but find classroom hours a challenge to meet? Q Academy’s cert IV in massage therapy online course has everything you need to start. Cupping is a highly popular and sought-after therapy which involves applying a vacuum with plastic or glass cups to relieve muscular tension & assist in facial release. The theory behind traditional Thai massage is based on traditional Thai medicine and the premise that the human body contains 10 energy lines (sen), which extend the full length of the body. This workshop is designed to increase the skills and knowledge of therapists to assist when working with athletes, sporting teams or other active clients in relation to injury prevention and management. Reflexology is based on the principle that reflex areas in the feet, hands and ears relate to the internal organs and other structures of the body. This workshop is based on the highly popular and sought-after cupping therapy that helps release muscular tension & assist in facial release. This is not a stretching course, but a course about movement. You will learn how to integrate assessment, massage and exercise in a simple straight forward and effective way, and have fun doing so. Manual Lymphatic Drainage (MLD) is a very gentle specialised body treatment that encourages the flow of lymph, enhancing the body’s ability to recover and function naturally. 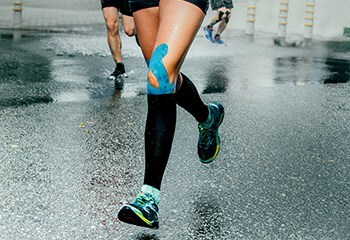 Kinesiology taping primarily targets musculoskeletal pain following injury and/or fatigue. It is widely used in many areas of the sporting community including Olympians and elite sporting teams. See if massage is something you would like to do for a career or just be able to treat your loved ones. This course is for massage therapists who are looking to expand their skills to be able to confidently treat expectant mothers and children. Hot rock massage is a luxurious treatment using warm rocks to melt away stress and tension. Stones are placed under the body, on the body and are used to massage deep into the muscles. Introduce foam rolling to your treatments, or teach techniques to your clients. Looking to broaden your skills and the services you can offer? Studying the introduction to body treatments is fun and easy and your clients will love the treatments. Become a confident therapist treating corporate clients. You will learn techniques on trigger points, how to incorporate Myofascial techniques (MFR), Shiatsu, METs, stretching and kneading techniques. It can be hard work getting clients in the door. With this short course we show you skills to keep your clients coming back! It is a fun, no nonsense workshop that will leave you with real skills and strategies to get the results you and your clients want. Lean the traditional Eastern practice of holistic health. This can be offered on its own or used with other treatments to provide a super-treatment! 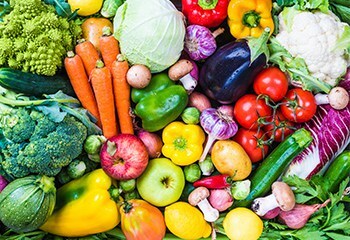 This subject provides students with the knowledge to confidently give advice and recommendations about nutrition to improve the health and well-being of their clients. Enjoy learning fundamental massage techniques, so you can offer treatments to friends and family. Want to learn how to provide a quick and effective relief for tension headaches, should and neck pain, stress and tension? Seated massage could be the short course for you! Discover modern techniques of Thai massage using palms, knees and elbows which combine stretching and deep sustained pressure. This fully clothed massage technique is performed on a massage table and can deliver very effective results for clients. An introductory course in human anatomy and physiology, this is a great course for anyone interested in a career in the health industry. Want to give a basic, yet effective, massage to your friends and family? This course is for you! This short course is also a great entry point if you’re considering becoming a professional massage therapist. Once you have completed this nationally accredited online short course (including assessments), you will receive a statement of attainment for HLTREF002. 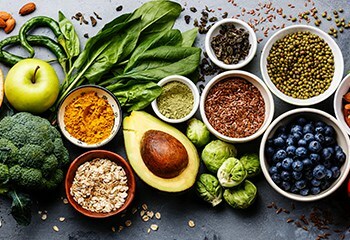 Upon completing this nationally accredited online short course (including assessments), you will receive a statement of attainment for HLTHPS010 Interpret and use information about nutrition and diet. By completing this nationally accredited course (with assessments and clinical practice), you will receive a statement of attainment for the HLTMSG004. Please note that Q Academy does not guarantee qualification or career outcomes for students. Why study massage with Q Academy? Studying with Q Academy means you can choose from a range of government accredited qualification, from one of Australia’s most trusted massage therapy training organisations. We understand that the qualification is only the first step towards a new, rewarding career. This is why we are dedicated to the education, training and career outcomes of our students. Q Academy has a job centre that connects graduates with industry employers. We have one of the highest student graduation rates in our industry; with almost 80% of students completing their enrolled course. It is the motivated, supportive and experienced Q Academy team that helps our students get to graduation. All of Q Academy’s courses are nationally accredited. This means the qualification is recognised Australia-wide, and graduates can register for association membership with leading industry associations such as AAMT, ANTA & AMA. If eligible, this will then allow you to obtain private provider numbers that are needed to offer clients private healthcare rebates. All our courses are science-based and have been written by a specialist team, using the same textbooks and reference materials as physiotherapists, osteopaths and myotherapists. Current, high-level, quality learning materials are guaranteed. We want our graduates to be leaders of the massage therapy industry. This is why we welcome them back to refresh and re-sit all or any part of their qualification; even after graduation. This includes free first aid updates…for life. To help students start studying sooner, we offer 3 different payment options for eligible courses. Up-front and self-funded, or through loan services such as MacCredit or the Government’s VET Student Loan Scheme. Remedial Massage will continue to attract Private health insurance rebates after April 2019 when Private health insurance providers will no longer be subsidised for providing rebates across 12–16 natural therapies. Due to the current skill shortages Massage Therapist job roles have been listed under the Temporary Skills Shortage (TSS) visa’s Short Term Skills Occupation List10 – a list which specifies occupations for 482 visa and migration application. In February 2019 the Australian Skills Quality Authority (ASQA) conducted a survey of over 500 of our Q Academy graduates and students and 93% of the respondents indicated that they would recommend studying at Q Academy to their friends and family. Had a great time! The course coaches were great and I felt comfortable and supported. What I learnt in Remedial Massage I can use to further my studies. Thanks guys! I had an awesome time! Learnt heaps! Great environment to learn, fun course coaches and great class mates!!!! Had a fantastic time learning new skills with a great group of people. Loved it!!! A fun and rewarding course. Class mates made the course enjoyable and lots of fun. All coaches were experienced and ensured everyone was the best they could be. Had an awesome experience doing Cert 4. Coaches and staff are amazing and the girls in my group, amazing and i hope to continue on in the future, friends and fellow work mates. Whether you wish to study massage online or on-campus, Q Academy hopes to make your learning experience as convenient as possible. 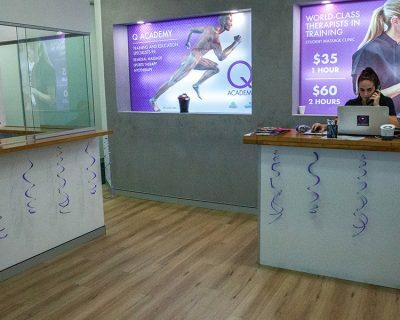 If you love the supportive and motivational nature of the classroom, Q Academy has campuses in Brisbane, the Gold Coast and the Sunshine coast. If you prefer more independence and flexibility with your learning, Q Academy offers massage therapy courses online through their online division, NETQ. You can enrol and purchase individual subject modules reducing the upfront cost. These courses are delivered through engaging online videos, flipbook manuals as well as cloud-based assessment and knowledge checks. If you wish to repeat or replay online content, this can be done 24/7, something that can’t be offered in a classroom. We have worked especially hard to ensure students completing one of our online massage courses are given the same amount of guidance and support as our students studying massage on-campus. Our staff do this through our online virtual classrooms where you work together with other online students and your Q Academy tutor. Are you interested in learning a science-based massage therapy course from a government accredited massage school? With our massage schools located in Brisbane, the Gold Coast and Sunshine Coast there is always free, live, and convenient after-hours support for our students. Q Academy students also have 24/7 access to online massage course reference materials to enhance their learning—at no extra cost. Whether you wish to study massage online or on-campus, we’re confident you will thoroughly enjoy, and be impressed by, Q Academy’s services. Q Academy’s HLT52015 Diploma of Remedial Massage is considered to be the benchmark qualification for a rewarding career in massage therapy. Complete a course in Sports Therapy with Q Academy and get your career in the sports industry started! Q Academy’s HLT42015 Certificate IV in Massage Therapy is an elementary-level qualification in the massage industry – perfect for someone looking to expand their skill-set to complement an existing qualification (e.g. 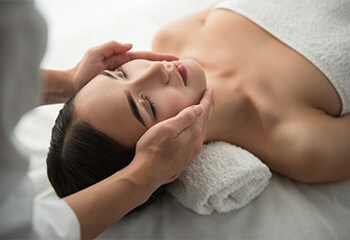 beauty therapy or personal training), or to treat a small client base of friends and family. Please fill in the online enquiry form to enquire about one of our courses. One of our friendly team members will get back to you as soon as possible. Since changes came into effect in November 2013, graduates of the Diploma of Remedial Massage wishing to obtain provider numbers from Medibank, must satisfy Medibank’s reformed minimum education standard requirements. As dictated by Medibank’s requirements, the Diploma of Remedial Massage course must be a minimum duration of an Academic year for full time study, or 18 months part-time. A minimum of 20% of the course is to be conducted on campus supervised by a trainer with the appropriate qualifications. 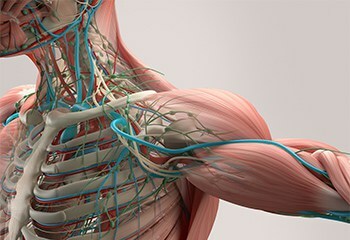 The practical components of massage therapy courses must include surface anatomy, palpation, clinical examination, assessment of conditions, treatment plans, tactile therapies massage techniques and other associated therapeutics and techniques. Not all massage courses provided by other massage schools satisfy these requirements, so careful consideration when selecting a massage course and a massage school should be taken. 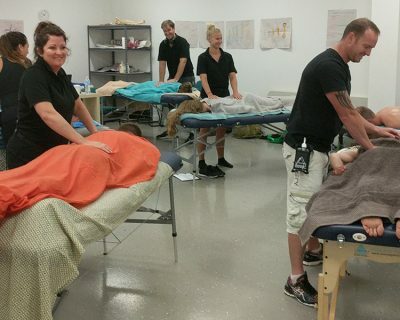 Students graduating from the Q Academy HLT52015 Diploma of Remedial Massage on-campus courses will satisfy all of the stated requirements, therefore making Q Academy’s on-campus graduates Medibank compliant and also HCF compliant. Q Academy’s massage school graduates who are Medibank compliant can therefore obtain private health care insurance provider numbers, as well apply for membership with professional industry associations, such as ANTA, MMA, AAMT and AMT. In order to apply to these associations, Q Academy graduates will be provided with a letter stating that they have satisfied the necessary criteria, along with their graduate statement of attainment. This letter is required by the associations mentioned above, in order for individuals to gain membership. Q Academy value integrity and honesty with our students, and will always disclose any industry changes which may threaten our student’s chances of being association members. Please ensure that any other massage schools that you are considering have similar values. Requirements are changing for industry recognition and Q Academy will always ensure that their Massage courses successfully satisfy all of the necessary industry requirements, so that graduates of our massage school have the necessary qualifications and sufficient documentation needed within the massage industry. As it is important to Q Academy that our students meet all industry standards, our self funded graduates are able to refresh any Unit of Competency they have previously completed successfully through our unique “Student for Life” (free retraining) guarantee that also covers First Aid so that it can be studied for free each year. Once you graduate from one of Q Academy’s massage courses, you will always have the resources and support to ensure that you’ll remain industry compliant. What are you waiting for? Enrol in a Massage Course at one of our Massage Schools Today! You can fill out our “Enrolment Form” at the top of this page, or simply call us on 1300 20 40 80, where we will answer any questions that you may have.